LARZEP cylinders are made of the highest quality materials. Our ranges of products are able to perform all kind of industrial applications such as: lifting, pushing, pulling, bending, holding, etc. The Quality System UNE-EN ISO 9001 since 1995 and the standard ANSI-B30.1 / EN1494 guarantees the design, manufacturing, supply and aftersales service. All our products are tested individually in order to maximize the quality and the safety of all them. Fully comply with ANSI-B30.1 / EN1494. All units load tested under 125% of the nominal capacity. Cylinder bodies made out of solid high strength alloy steel. Wiper seal reduces contamination and allows longer life. Wear rings for long service life and high absorption of side loads. Hardened grooved saddles as standard, optional tilting saddles improve side load resistance. Heavy cylinders include carrying handles or eye bolts. Female coupling AZ3140 with plastic dust cap included in all cylinders. 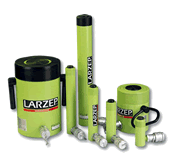 LARZEP designs and manufactures special cylinders and fixing systems.